Puppies typically leave their mothers and littermates and are placed in homes between 8 to 12 weeks of age. Therefore, if you are adopting or purchasing a young puppy, there's a good chance the puppy is nearing 12 weeks of age (three months old). Puppies go through some major physical and behavioral changes from three to six months of age. Be prepared to care for your puppy during this crucial development stage. Around 12 weeks of age, puppies begin to have better control of their bladders and bowels. They may begin to sleep through the night without accidents or potty breaks. House training may begin to go more smoothly over the coming weeks. Make sure you keep to a fairly regular schedule. Most dogs can be fully house trained by age four to five months. By 12 weeks of age, your puppy will have begun teething. You may notice excessive biting and chewing, bruised or red gums, and teeth missing from the mouth. You may even find the occasional baby tooth! When teething, some puppies become frustrated or agitated. They may "act out" more or be picky about food on certain days. Be sure to provide plenty of puppy-safe toys during this time. Keep dangerous "chewables" out of reach (like electrical cords, shoes, and houseplants). You should keep your puppy in the crate when you are not home in order to keep her safe. Teething should slow down around 16 weeks, or four months of age. All adult teeth will be in by six months of age. Between 12-16 weeks of age, your puppy will begin to look a little bit less like a baby puppy and a little more like a miniature version of the dog she will become. She will likely grow rapidly from four to six months of age. By six months of age, your puppy will be closer to her future adult size. Most small dog breeds will be nearly finished growing at six months of age. Large and giant dog breeds may be at about half their adult size. Medium dogs still have some more growing left to do, but they are usually about 75% grown by the age of six months. Your 12-week-old puppy is nearing the end of a critical socialization window. Make the most of this time period by exposing your dog to new people, places, and things. Until your dog is fully vaccinated, she should not be around unknown animals or on the ground in public places. Try to have a variety of people and healthy animals visit your home and have a positive experience with your puppy. You can take your dog to homes where you know the pets are vaccinated and healthy. Carry your dog in public spaces, exposing her to loud noises, falling objects, and small crowds. Work on puppy handling exercises so she gets used to being handled. While socializing your puppy, always keep things positive and upbeat. Puppies typically experience a period of fearfulness around 16 weeks of age. This is a normal part of your puppy's social development as she learns how to react to her environment. Avoid overwhelming your pup when you notice fearful reactions. This is not the time for loud noises, falling objects, or crowds of people. It is also important not to reward fearful behavior or you will be confirming your puppy's fears. Instead, ignore the fearful behavior and gently remove your puppy from the source of the fear. Reward calm, happy behavior instead. Between three and six months of age, your puppy is approaching adolescence. Expect to see a bit of a rebellious side to your puppy as she begins to test her limits. You may notice your dog ignoring cues that she was previously trained on. She may also have some destructive chewing in this stage (caused by a combination of teething, general juvenile misbehaving, and possibly boredom). Make sure your puppy gets plenty of exercise and keep working on training regularly. Be consistent and firm. 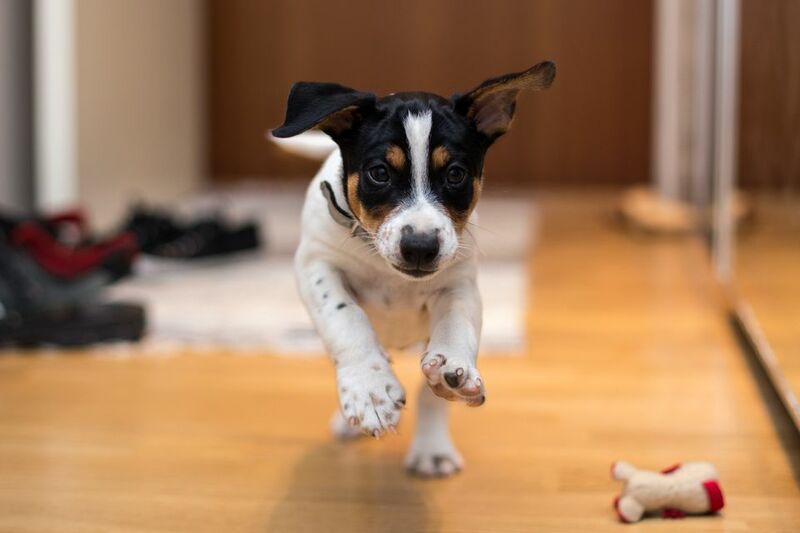 Your puppy will need to visit the veterinarian regularly for puppy vaccines, deworming, and routine check-ups between the ages of 8 to 16 weeks. During this time period, it is important to keep your puppy away from unknown animals and public spaces where other animals may have been. When vaccines are completed and your vet gives the all-clear, your puppy can begin to go on walks, visit the park, and play with other dogs (under careful supervision, of course). After four months of age, most puppies will not need to see the vet for a routine visit until adulthood. At the final puppy visit (usually when the rabies vaccine is given, around 16 weeks of age) be sure to ask any remaining questions. Talk to your veterinarian about the best way to care for your fast-growing puppy. If your dog will be spayed or neutered, this is often done between five and six months of age. Ask your veterinarian for individual recommendations for your dog. The ideal age to spay or neuter may vary based on breed and size. Proper nutrition is an essential part of your puppy's development. Be sure you are feeding puppy food (dog food labeled for growth) and that you are feeding the appropriate amount. Your puppy will need more and more food as she grows. During this time of rapid growth, evaluate the amount you feed your puppy at least once a week to determine if you need to adjust it. Commercial diets will have a feeding chart based on the puppy's age and weight. If you choose to feed homemade puppy food, you will need to take extra care to feed the appropriate recipe and calorie content. When feeding treats, make sure they are healthy, non-toxic, and not fed in excess. Dog treats should never make up more than 10% of your puppy's daily food intake. When giving chews, avoid bones, antlers, hooves, hard nylon dog toys, or other hard chews. Adult teeth are still coming in and may cause oral pain or injury if chewed. You should begin training your puppy the moment she comes home with you. One of the first things you will focus on is house training. Most puppies begin to get the hang of this between 12 and 16 weeks of age and will be fully house trained by about four or five months old. It is also important to focus on obedience training. Teach your puppy basic commands like sit, stay, and down. Train the recall cue as soon as possible. You will also need to teach manners, like not to jump up, not to bark excessively, and not to bite (many puppies are especially mouthy between 12 to 16 weeks old). Leash training is important at this stage of your puppy's life. After 16 weeks of age, you can begin to walk your dog in public. Start getting your pup used to the leash no later than 12 weeks of age. Then, train your pup to walk on the leash. Start in your house, then move to your yard. Work your way up to the outdoors. One of the best ways to start your puppy's training is by signing up for a puppy training class. Classes are run by experienced trainers who can help guide you through basic training and even address some minor puppy behavior problems. The classes contain small groups of healthy, vaccinated puppies. Puppy training classes can help socialize your dog and enable her to learn despite distractions.